Requires iOS 7.1 or later. Compatible with iPhone, iPad, and iPod touch. This app is optimized for iPhone 5. Thanks for all your feedback! It's an honor to be able to provide the Oblique Strategies to everyone that owns an iPhone. We are working on an iPad version now as we speak so be on the lookout for that! Don't forget to leave us a review! Happy problem solving, creatives! Oblique Strategies is a deck of cards that's intended to help in solving problems, boost creativity, and inspire new ways of thinking. This is an ideal solution for writer's block and breaking dilemma situations. 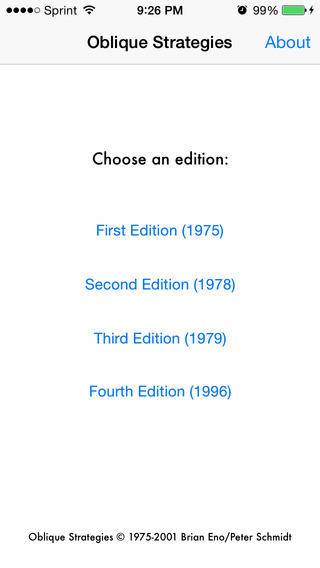 This app contains all four editions of Oblique Strategies.